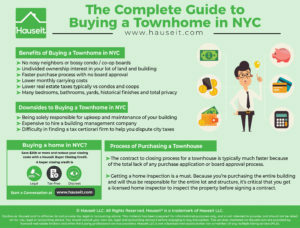 Buying a townhome in NYC means total privacy and freedom from nosy neighbors and even nosier condo or co-op boards. You won’t have to get approval to buy or sell, you won’t have to pay silly fees to the board and you won’t have to fill out an intrusive purchase application or sit through a grueling coop board interview. On the other hand, owning a townhouse comes with significantly more responsibilities. Who’s going to keep the hallways, backyard and your stoop clean and swept? Who’s going to manage your tax dispute with the city’s property assessors? The benefits of buying a townhome include not having to deal with nosy neighbors or a bossy condo or co-op board. Furthermore, you’ll have an undivided ownership interest in your lot of land, meaning you won’t have to get consent or agreement from any neighbors if you want to renovate or even just redecorate your property. In fact, the purchase process itself is much faster if you’re buying a townhome. There won’t be a coop board approval process and you won’t have to get a condo board’s waiver of their right of first refusal. This means no lengthy purchase applications or coop board interviews to deal with, and all the intrusiveness that comes with that whole process. Don’t forget about the lower monthly carrying costs associated with buying a townhome. You won’t have a condo or co-op board, which also means no one will be levying monthly common charges, maintenance fees and special assessments against you like you’re some kind of sharecropper. Sure, you’ll still have expenses for the upkeep of your townhome, but they’re bound to be lower because you won’t to pay for all the amenities like gyms and swimming pools that can come with big condo and coop buildings in NYC. Furthermore, real estate taxes are typically lower for single and even multi-family townhomes vs apartment buildings. Lastly, townhomes are a unique property type with many bedrooms, bathrooms, yards, gardens and total privacy as just some of the benefits. 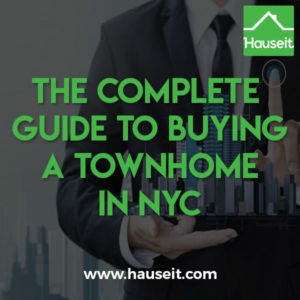 Because most townhouses in NYC were built in the 19th and early 20th centuries, many of these properties are unique and rich with historical details like stained glass windows, custom woodwork, and opulent fireplaces. Many townhomes are also situated in unique, tree-lined streets in historical districts. The downsides to buying a townhome in NYC include being solely responsible for the upkeep and maintenance of your building. That means being on the hook if the building’s roof leaks, or if the building’s boiler breaks down and needs to be replaced. Will you have time to call and get quotes from plumbers, and be around to supervise their work? Or how about having to shovel the sidewalk in front of your building on a snowy day, salting your icy stoop, or taking your garbage to the curb on specified days of the week? You could hire a building management company or even just a superintendent to help you manage the building, but you wouldn’t have any neighbors to split the cost. That can get pretty expensive since a managing agent may not necessarily charge less or much less for a smaller building vs a larger building if the amount of work required is roughly the same. You might also encounter issues with NYC real estate taxes, especially if you feel like you were over assessed. In a condo or co-op building, the board may hire a tax certiorari firm to dispute city tax assessments on behalf of the entire building. However, a tax certiorari firm will typically be hesitate to work for a single unit owner. The work involved won’t be much different whether it’s a single unit vs an entire apartment building, and the fee has to be meaningful. As a result, you run a real risk of not being able to find or afford a tax certiorari firm, and having to dispute city property taxes by yourself. 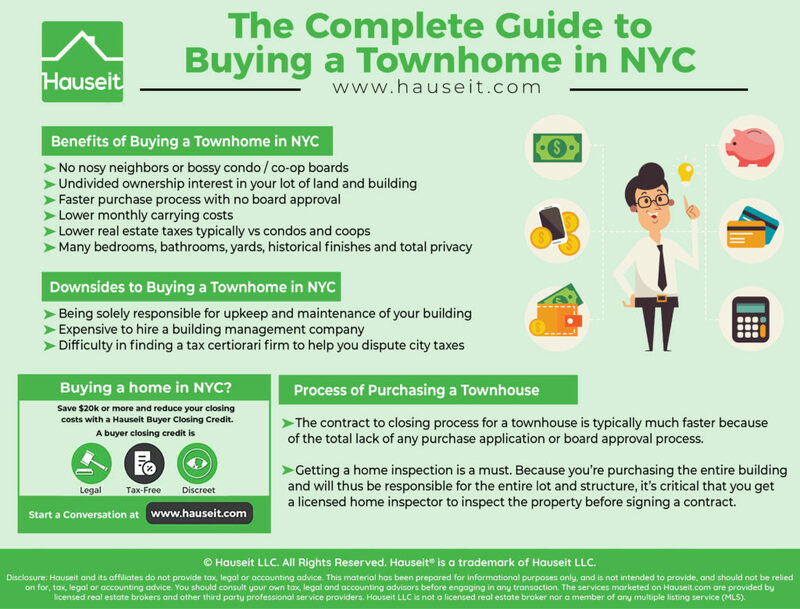 The process for purchasing a townhouse is no different than the process of buying a condo or buying a coop in NYC other than a couple of very important distinctions. The first difference is that the contract to closing process for a townhouse is typically much faster because of the total lack of any purchase application or board approval process. If the seller wants to sell to you, then it’s decided. There are no massive coop board applications, intrusive coop board interviews, condo right of first refusals or any other neighbor related hurdles to jump through. 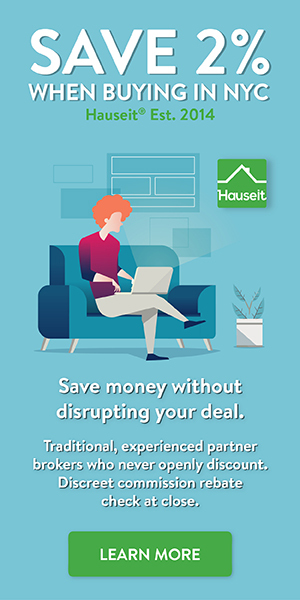 Even better, you won’t have to bother with paying any move-in, move-out, application or other random fees to a condo or co-op board. The second distinction of the townhome purchase process is that getting a home inspection is a must. Because you’re purchasing the entire building and will thus be responsible for the entire lot and structure, it’s critical that you get a licensed home inspector to inspect the property before signing a contract. By having your inspection done before signing a contract, you have the opportunity to back out or renegotiate if the inspector catches any defects in the property that you might have missed. If you for some reason do an inspection after contracts have been signed, you may be out of luck unless your attorney has negotiated some sort of an inspection contingency for you in the contract (unusual in New York, where the only “standard contingency” is really the mortgage contingency). If you’re purchasing all cash, a closing can take place within 30 days of contract signing. If you’re purchasing with a mortgage, the process can take up to 45 to 60 days on average, depending on how fast your bank can get you a mortgage commitment letter and a clear to close. Owning a townhouse is a very different experience vs owning a condo or co-op apartment. You won’t have a building management company and superintendent to take out the garbage, to vacuum the hallways and to shovel the snow. Unless you hire a part-time janitor or superintendent who perhaps manages multiple buildings in the neighborhood, you won’t have someone to call for minor repairs and maintenance. You won’t have someone to call if you get nervous after seeing a cockroach, and you’ll have to source your own quotes from exterminator companies. You’ll have to source and manage plumbers, electricians and all sorts of other contractors if something breaks down in your building like the boilers or HVAC systems. You’ll have to deal with Local Law 11 inspections yourself if your building is tall enough to warrant one. If you feel like your property was over assessed for real estate taxes, you may have to dispute the taxes with the local authorities yourself. That’s because most tax certiorari firms won’t bother with single unit owners, or owners of small townhomes who can’t pay up. Most of these tax certiorari firms are used to dealing with large apartment buildings, where they do the same amount of work but on behalf of all owners in the building. So while there are many benefits to owning a townhouse, just be prepared to take on more responsibility as well!